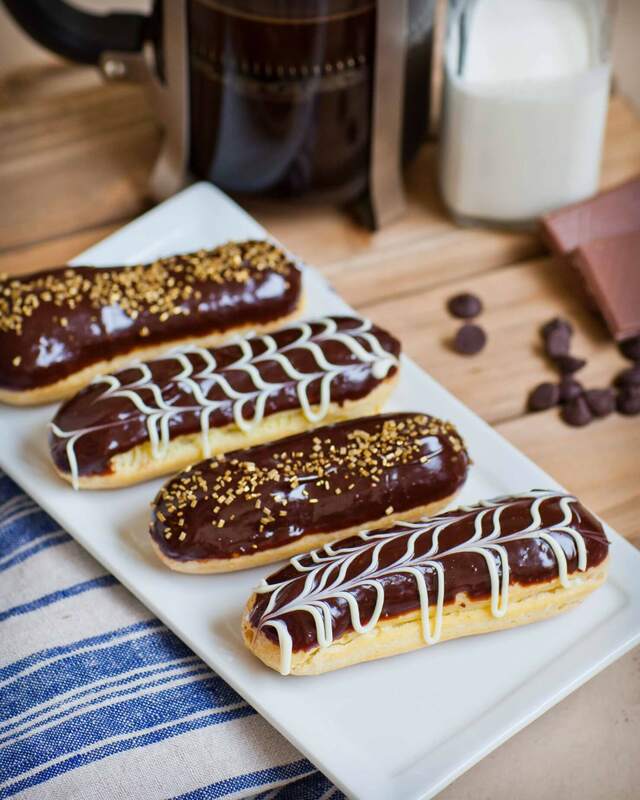 Chocolate coffee eclairs – I cannot say enough about how delicious these are! You’ll fall in love with this pate a choux dessert from the first bite! These beauties are piped full of creamy coffee custard filling; not too sweet and just the right amount of goodness, then dipped into chocolate. I love garnishing the top with white chocolate and gold sprinkles to make these extra special. Enjoy these coffee custard eclairs with a cup of coffee or a glass of wine after dinner. Watch my video recipe for step-by-step instructions! Watch my video recipe for all the details on making these amazing treats! And, make sure to subscribe to my YouTube channel to get new recipe updates! This elegant, show-stopping dessert can seem intimidating to make at home, but it’s actually quite easy! You’ll need just 5 ingredients for the eclair shells – eggs, water, flour, butter and a pinch of salt! Here are a few tips for making pate a choux successfully! When baking the eclair shells, resist the temptation to open your oven door! These shells are very temperature sensitive and can collapse easily with a blast of cool air. Bake the shells until they are a deep golden color; underbaking will also cause them to collapse. I recommend filling the pastries the same day, once they cool. The shells can and will go stale if left out uncovered. These custard eclairs are filled with an amazing coffee-flavor custard cream. The first step is making a simple custard with a touch of coffee. Once the custard is completely cooled, a bit of butter is added to make it fluffier. This filling is similar to a German buttercream. You can learn more about making the custard and buttercream with my tutorial HERE. Once you have these stunning coffee custard eclairs assembled, keep them refrigerated for up to 3 days until you’re ready to enjoy! Love eclairs? Try these next! Enjoyed this recipe? Please save and share on Pinterest! I love my handheld KitchenAid mixer is great for smaller jobs like mixing batter. Use these non-stick silicone mats for baking, along with these aluminum baking sheets. This set of jumbo cake decorating tips includes my favorite tips. And this filling tip by Ateco is great for piping eclairs and cream puffs full of cream. Preheat oven to 425F/218C. Line 2 baking sheets with parchment paper or silicone mats; set aside. Also, prepare a large pastry bag with a French star tip, I used #8FT. Prepare the eclair shells first. In a medium-sized sauce pan, combine the water, butter and salt. Melt the butter completely and bring the mixture to a simmer over medium heat. Once simmering, add all of the flour at once. Using a spatula, stir the dough together until it pulls together into a ball, about 1 minute. Transfer the dough in a large mixing bowl and allow it to cool for about 5 to 7 minutes, until warm to touch. Once dough has cooled slightly, begin whisking in 1 egg at a time. After adding the last egg, keep mixing until mixture is smoothing and uniform. Transfer the dough into the prepared pastry bag and pipe onto baking sheets in 4 to 6-inch logs. Try to pipe the dough evenly, applying equal pressure for an even eclair. Bake the eclairs at 425F for 10 minutes, then reduce the oven temperature to 350F/177C and bake for an additional 30 minutes. DO NOT OPEN oven door while baking! This will cause the eclairs to fall flat! Check the eclairs for a rich golden color through the oven door. Once eclairs are baked, gently transfer them onto a cooling rack to cool completely. Once eclairs are cooled, poke 2 to 3 holes into the bottom of each eclair with a small pastry tip to add the filling. While eclairs are baking, prepare the coffee custard. In a large bowl, whisk together the egg yolks and 1/3 cup sugar until pale and thick. In a separate bowl, create a slurry with the cornstarch and water. Add the mixture to the egg yolks and sugar. In a sauce pan, combine the milk and flour and heat over medium heat until steaming hot. Add the hot milk to the egg mixture in small amounts, whisking after each additional until all of the milk is added. Transfer the mixture back into the sauce pan and cook over medium heat, stirring constantly, until the mixture thickens into a custard. Once the mixture has thickened, add the Kahlua and instant coffee; stir until the coffee is completely dissolved. Transfer the coffee custard into a large bowl, cover the top with plastic wrap and cool completely in the refrigerator. Once cooled, use a mixer to whisk air into the custard, then gradually add the 1/4 cup softened butter, 1 tablespoon at a time, until a light cream forms. Transfer the cream into a pastry bag tipped with a filling tip (I used Wilton #230). Pipe the coffee custard into each eclair, filling them completely on the inside. You should feel the eclair expand slightly as you fill it. Prepare the chocolate glaze last. Heat the heavy cream until steaming hot, then pour over the chocolate chips. Stir until the chocolate glaze is completely smooth. Dip the top side of each eclair into the chocolate, tapping off any excess chocolate. Set them down onto a wire rack for storage. For garnishing, use white chocolate or gold sprinkles. If adding the white chocolate, transfer it into a disposable bag the pipe thin lines onto the top; do this while the chocolate has not yet set. Run a toothpick lengthwise to create the design pictured above. If not serving eclairs right away, keep them refrigerated. Made these eclairs yesterday and they turned out perfectly!! Hi Tatyana, Thank you for the great recipe, one question, can I use tip Wilton 1M for piping the eclairs? In your video you said to use unsalted butter, but the recipe just has butter which usually means salted. I only have salted butter, will this be alright to use? Should I cut the salt? Thank you. Hi. The eclairs turned out OK but the custard, can’t say that it did. I put it in the fridge like you said, when it cooled off, I whipped it for a few minutes and started adding butter, it just did not wanna mix in, I had clumpy mixture:/ why?? I tried using a spoon to break down the clumps to make it look better but ofcourse it didn’t help at all. I also only got 12 eclairs, I made them thin and only 4″, do you double your batter? Hello.. I have a question about the ingredients for the chocolate glaze. You use heavy cream, but I can’t buy that in The Netherlands. Can I replace it with single cream? Thank you. I’d like to make these for a wedding. Can they be made ahead of time? Can you tell me the best way to store them? Can they be frozen w the filling inside? When placed on the dessert table, how long can they stay at room temp? Do you think the cream would leak out? I made these last time and my cream curdled and became very runny,, do you know why that happened? I left my custard in the fridge for 3 hours before putting in the butter. Then when I added the butter, the cream curdled and became runny. How can I prevent that from happening next time? I didn’t have enough cream to fill the eclairs. Id like to practice before the wedding. They were still delicious but I think the eclairs can still be better. These will not freeze well. You can prepare the shells ahead of time and keep them stored in an airtight container. You can also make the filling ahead of time, but you’ll need to fill these the night before. They should be just fine on the tables for a while.